Denver Mayor Michael Hancock presents his 2019 budget proposal at the Denver City &amp; County Building on Thursday, Sept. 13, 2018. 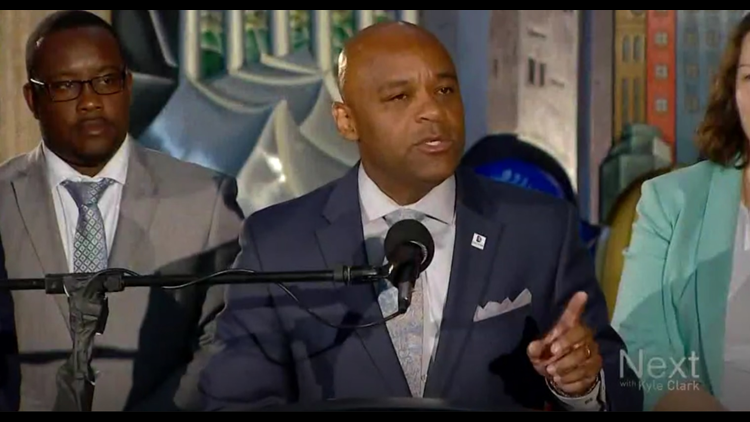 Denver Mayor Michael Hancock is considering a minimum wage increase to $15 an hour for city employees that would be phased in over several years. DENVER — Denver Mayor Michael Hancock is exploring an increase to the minimum wage for city employees and those who work for businesses that operate in city facilities. That comes out to about 1,900 people. The mayor’s office said it’s looking at a $15 an hour minimum wage that would be phased in over several years. “While unemployment is low and Denver’s economy is among the strongest in the country, wage growth has not kept pace with a rising cost of living,” Hancock said in a news release. The Department of Finance will be tasked with exploring the increased starting pay for city, contractor, vendor and tenant employees. In the release, Hancock said the review process will include outreach to community stakeholders, private sector partners and employees. Those findings will then be presented to the mayor for consideration in early 2019. Mike Strott, the mayor's office spokesperson, said raising the minimum wage would cost the city anywhere between $2 and $4 million. That money would come from the city's general fund. Strott said the city was looking at phasing in the wage hike. Colorado’s current minimum wage is $10.20. Strott told 9NEWS the mayor doesn't need city council approval to make the change for city workers, but city council would need to weigh in on raising the minimum wage for contractors and vendors since that would change regulations for those businesses. The mayor's office picked $15 since that appears to be the national trend, Strott added.